Happy Monday, friends! Did you know that Halloween is this week? If you live in our house, you could not NOT know because my younger daughter, C, has been announcing the countdown every morning. Yeah, she's excited to don her Belle costume with tiara and all. Today's Make It Monday is a little different. First, I'd like to high five, hug, and congratulate all the mommas out there (and grandmas, aunts, and friends) who have worked and designed some beautiful costumes for their littles. Louise has made some gorgeous looks for her girls, and I know Sandra will be revealing her unicorn costume for the girl this week, too. I'm the daughter of a momma who sewed my costumes all the way through middle school, and I was that child that always put forth a challenging idea. She put together Miss Piggy, Rudolph, a bunny rabbit, a mouse, a Hershey's kiss.. and many more. Part of the fun was thinking up something I didn't think I could find, and having it fit right to me by my very own mother. She's a talented lady. When I became the momma, I took it as a personal challenge and a near-necessity that I sew my children's Halloween costumes. To many this is very normal, fairly easy, and happens like clockwork every fall. For me, this was a process, over two months of work, and nothing close to easy. You see the first costumes I made for my girls. 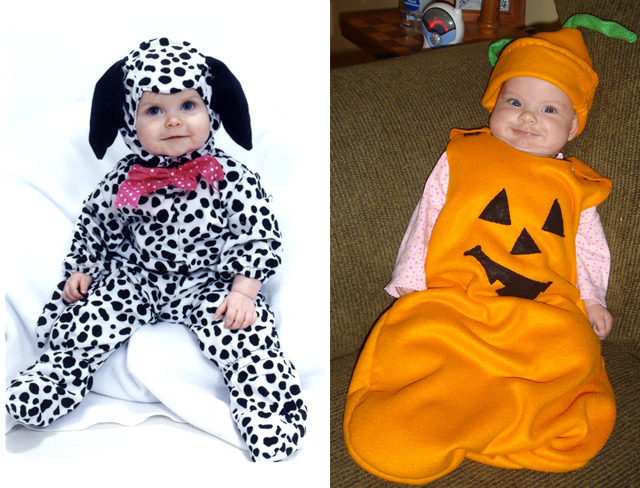 M was a dalmation pup her first trick or treat season, and C was the pumkin bunting I'd always wanted to sew. For the first four years of motherhood, I sewed costumes. In fact, much of any free time in the Augusts, Septembers, and Octobers was found with me sitting on the couch, hand sewing each piece. My mom, in an effort to simplify my life, bought me a Singer sewing machine, but I always returned to the handstitch because I loved the feel of needle-and-thread creations. When my oldest daughter turned five, she quickly turned into a young version of me, ready to challenge her momma with some creative costuming ideas. Eeps. So we hit Joanne's in August. By September, she had changed her mind and wanted something different. Two weeks after that she changed again. October came, and she had still not decided for sure what she wanted to be. I was stressed, I was making her stressed (why does Mommy keep asking me about Halloween? ), and I was dreading Halloween. I read this post from Meg last week, and it got me thinking. Go check out point 2. And I'd like to send all of you very talented mothers out there who are NOT making costumes this year (or any year) a big smooch. I gave it up. Or at least for now. Why, say you? Because frankly, my daughters wanted to be princesses with all the Disney, glitter, and plastic high heels that I could find for them. My son wanted to be Elmo with the big googly eyes and red furry paws. M wanted to change her mind four times and then change it again once she saw the Halloween costume catalog that arrived at our house. And, more than I wanted to be the mother I had preconceived notions of being, I want my little goblins to be happy. I want Halloween to be a fun day, filled with candy and neighborhood greetings. I'm done with the stressed fall season and trying to box in my children's creativity and indecisive natures. And - honest here - Halloween is not an important holiday in our family, at least when you compare it to the real and made-up ones we treasure (eg: Thanksgiving, Christmas, Sisters Day, Yes Day, Easter). And I was spending months dedicated to something that would come and go for a day or less. This year I'll be walking the 'hood with a goddess, Belle, and Elmo. They are so excited to break into costume. And I'm delighted not to have trick or treat bags under my eyes any more. PS. Where do you fall? To buy or to sew? Or somewhere in the middles?